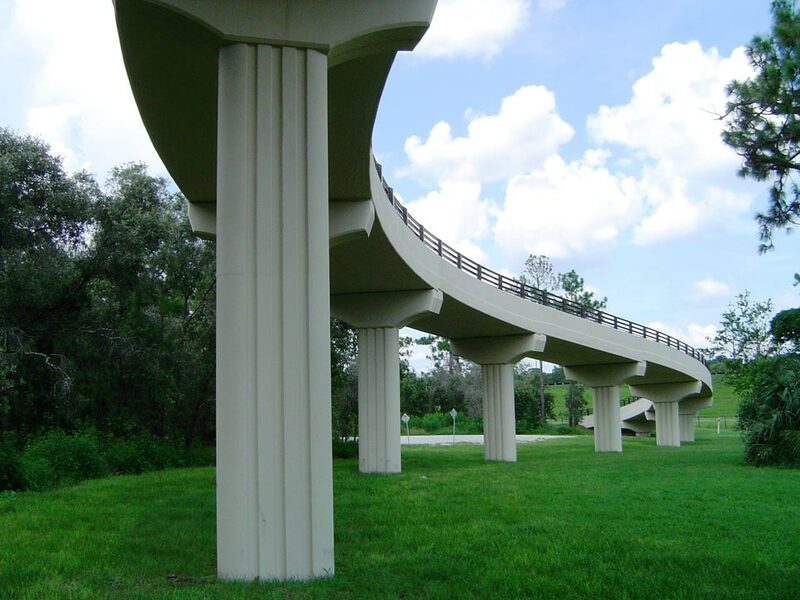 The Suncoast Bikeway and Pedestrian Bridge over SR 50 is a component of the Suncoast Parkway Trail, which parallels the Suncoast Parkway in Hernando County. KCA was the prime designer for the multi-use crossing over SR 50, which consists of a 21-span pedestrian structure that has an overall length of 883 feet. The 167-foot main span of the pedestrian bridge utilizes steel plate girders. The piers for the main span consist of single columns founded on 18-inch piles. The approach spans are simply-supported flat slab units comprised of precast deck panels and cast-in-place concrete toppings. The piers for the approach spans are also single column piers but are supported on shallow foundations. In addition to the 883-foot-long pedestrian bridge, this project also consisted of paving six miles of the 12-foot wide bikeway that parallels the Suncoast Parkway. Another unique aspect of these construction plans were that the traffic control plans used innovative pilot cars to lead emergency vehicles through the detour site while traffic on SR 50 was closed due to the girder being set.